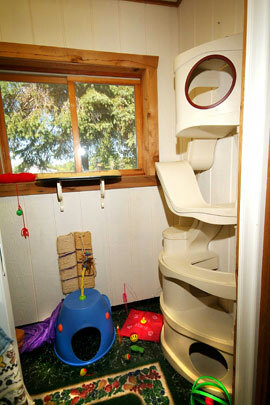 This area is very quiet and separate from the dog lodging to help the kitties relax and enjoy their stay. Although the cottage comes with toys and cute comfy beds, you are welcome to bring bedding and toys from home (their name must be on them). Two cats can share adjoining cottages for $15.49 per cat per day or you can reserve a deluxe cottage for a single cat for $20.49 per day. Fun recess time is included in the price. You also may choose the optional “Pamper Time” for additional fun and excitement. Take a virtual tour by moving your mouse or dragging your finger over the image below. Long romp in a private play area full of toys and a window view. 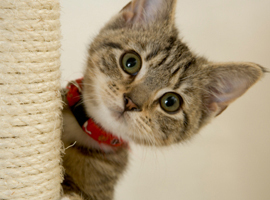 For cats it includes a kitty recess, brushing, cuddling, and individual attention with a Pet Care Assistant. $7 each.